International airline of United Arab Emirates (Dubai) flight status, flight search, special offers, online booking and flight schedules. 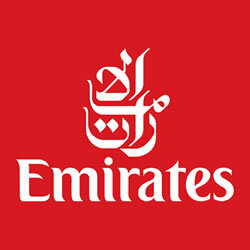 Emirates are one of the fastest growing airlines in the world and have received more than 300 international awards in recognition of its efforts to provide unsurpassed levels of customer service. Step aboard an interactive tour of all the elements that make up the Emirates difference, on and off the ground. Discover excellent service, outstanding comfort and superior technology. Please call this number for flights, Chauffeur-drive, Dubai Stopovers and other Emirates services related queries.